Van Gaal: "Making Mata captain was easy"
Louis Van Gaal has described the decision to hand Juan Mata the captain’s armband in Wednesday 1-0 against Watford was an easy decision given the Spaniard’s experience. 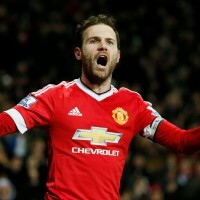 With Wayne Rooney, Chris Smalling, Michael Carrick and Bastian Schweinsteiger all unavailable, Mata was named captain for the night and repaid his manager’s faith by scoring the crucial winner seven minutes from time. “It was not difficult because I have an elder group of players with whom I’m talking about aspects of things – training sessions, meetings or how we have to approach players and so on,” said Van Gaal. In Rooney’s absence, perhaps Mata should be captain. I don’t see any leadership qualities in either Smalling or Carrick. Schweinstieger yes but he mostly tends to be conspicuous by his absence as far as the team is concerned. The biggest problem with this team is the lack of natural leaders. Schweisteneger is probably the only natural leader we have left in this squad and as was always likely injuries are limiting his influence. I’d have probably gone with Blind over Mata. He’s usually very composed and has for the most part done a very good job stabilizing our defence and like Schweisteneger he knows exactly what Van Gaal wants on the pitch. You want your captain to be in the thick of the action not drifting in and out of games which Mata tends to do. The real reason Mata got the captaincy is exactly what Van Gaal said-he was the most senior player available so it is for political reasons. After yesterday, I withdraw support for the idea that Mata might be a good choice as captain!